Educators Receive Training to Put "Science in Service of Puerto Rico"
Educators learn how to use Foldscope, one of the tools they received during the workshop. SAN JUAN, PR - The non-profit organization Ciencia Puerto Rico (CienciaPR, www.cienciapr.org), started the implementation of its ambitious science education project called "Ciencia Al Servicio de Puerto Rico" (Science in Service of Puerto Rico) with a couple of innovative workshops that trained educators in project-based learning (PBL) and contextualized education strategies, with a focus on common challenges created by Hurricanes Irma and Maria. The workshops, held on April 6 and 13 at the College of Engineers of Puerto Rico and the Boys and Girls Club of San Juan, respectively, involved 36 educators from 19 schools and 3 Boys and Girls Clubs in the municipalities of Carolina, San Juan, Trujillo Alto, San Lorenzo, Loíza, Aguas Buenas and Guaynabo. In addition to learning about PBL best practices and strategies, educators learned how to implement two scientific challenges aligned with 7th grade engineering design process standards. The first challenge is the design of a hand washing station that uses little water and cleaning agent, is accessible and easy to use, and uses little or no energy. The second challenge is to use a low-cost paper microscope called Foldscope for students to observe the biological diversity in a terrestrial ecosystem that was impacted by the hurricanes. The educators received training on how to use the microscope inspired by origami and that costs less than a dollar. Each of the 500 students participating in the project will receive the instrument free of charge. "I had the power of taking a microscopic look in hand, which awakened in me the power of knowledge," said Arleen Rosado, a science teacher at the René Marqués School in Carolina, summarizing her experience using the Foldscope. “This training gave me the tools I needed to be more effective when implementing the PBL methodology. 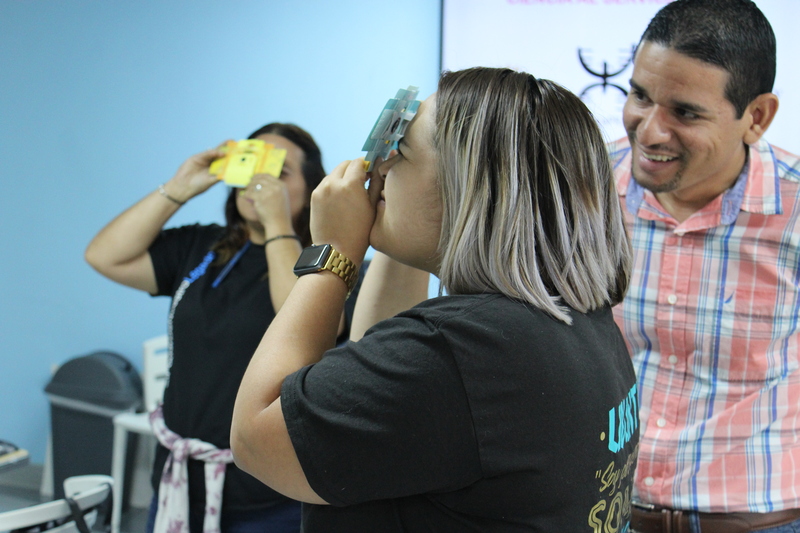 The training put me in the student's shoes, to think about how they would do the projects and this caused me to change my opinion about the strategies," added Jahaira Rivera, science teacher at Sotero Figueroa School in San Juan. The implementation of both challenges will continue for the rest of the semester until the month of June, when students will be conducting outreach activities to present the results of the projects to their school and their communities. "We hope that the development of these projects will be a learning experience for students, full of empowerment to search for solutions through science," said Dr. Greetchen Díaz, director of Science Education Programs and Community Partnerships of CienciaPR. The "Ciencia Al Servicio" workshops had the participation of Dr. Frances Figarella, PBL expert, CienciaPR staff, undergraduate students of the University of Puerto Rico, graduate students who were part of the Yale Ciencia Academy for Career Development (a collaboration between CienciaPR and Yale University), and graduate students of the engineering program of the Universidad del Turabo. The project is subsidized by the National Science Foundation (NSF).